Adelaide and Wilma are sisters and they should be extremely proud of what they have achieved. I met Adelaide about 6 years ago when she came to the Shankill Women's Centre sewing group and for the last 3 years have given her individual tuition. Her skills and confidence have soared and she has tackled everything from children's clothes, doggie clothes, memory quilts and much much more. Adelaide's work can be seen on facebook at Crafty Stitches. Wilma lives in New Zealand but is over in Belfast at present and I think they are really enjoying each others company sewing together. Wilma is a mean crocheter and knitter but had never tried sewing until early this year. She loves it now! Meet Barney. Adelaide and Wilma's beloved dog who loves to help out in the sewing home. He wishes he was a West Highland Terrier and could wear tartan. They had highly recommended I watch the TV series 'Outlander' . Written by Diana Gabaldon, these books were first published in the USA in 1990. However it would be at least another 20 years until they were developed for television. The drama is played out in the Scottish Highlands with breathtaking scenery and exquisite costumes to die for. Craig Na D'un, Standing Stones, Scotland. Who couldn't be inspired by this? The costumes designed by Terry Dresbach are stunning. The landscape, its array of textures and colours has inspired considered design. Scottish textile industries have been given new life employing weavers to make the tartans, knitters to knit and dyers to create the palette that would have existed in the 1700s when a large part of the story is set. Read more here. The Scots and Irish have welcomed a growing film and television industry and many of my friends who I worked with in the Game of Thrones costume department have also worked on Outlander. The Scots are well represented in GOT costume department. These include Crawford MacKenzie Costume Cutter, Lorraine Burn and Kirsty Hunt Principal costume makers. 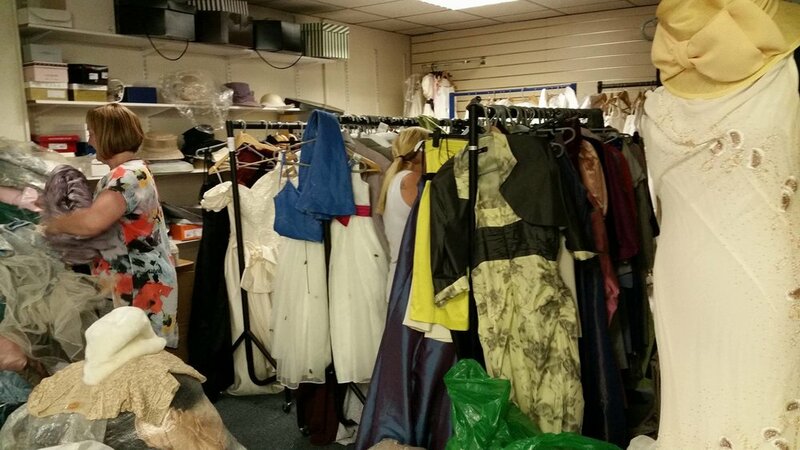 Each week the sisters would go out charity shopping, collating carefully chosen pieces to recreate into their costumes. Here are some of their garments so far. Adelaide and Wilma are let loose in the Hospice Shop, Ormeau Road, Belfast. We were in here for 2 hours! The story of Outlander moves between the 1740s and the 1940s. Adelaide and Wilma chose to create their costumes from both periods. Following the work of the costume designer Terry Dresbach on twitter, and her willingness to share how she designed and created each piece, Wilma sourced sketches and images to base their costumes on. Based on Dior's New Look design, Wilma used Terry's sketches and stills from the film to recreate the look. This photograph is before any reshaping and altering had been carried out. The black hat was £5, the black duchess satin skirts ( 2 for extra fullness) were £7 each and the cream satin jacket was £7. Adelaide chose Geillis Duncan trial costume to make. She had sourced a black velvet jacket and a cheesecloth blouse. We thought about how to create the hip shaping and chose black curtains, joining them at the centre back and drawing them in with the curtain tape for fullness. They worked really well. Both Adelaide and Wilma are now totally hooked on costume making and have loved the whole process. From watching the TV series at least once, finding a passion together, charity shopping and bargaining, putting together the outfits, reshaping, altering, fitting and looking for the final touches to complete the look. It takes a lot of hard work, blood, sweat and tears aren't uncommon, but when the adrenlin sets in and the deadline approaches its this creative buzz that keeps us costumiers hooked! The ladies hard at work creating their costumes. I have added more images to my facebook page Colour and Cloth Album ' Outlander Adelaide and Wilma'. Click here to visit gallery. This week (Thursday 25th August) the ladies fly out to Heathrow to meet the cast and lots of other people who have travelled from all over the world to be part of the Outlander family. I am so excited for them and very proud of them. There are prizes for best costume...I have my fingers crossed, because when they step into their costumes they will not only wear them, they will believe in them and be transported in time and place to where the story began. I will be reporting on the conference and how Wilma and Adelaide got on with plenty of pictures!